He would have been 90 on Nov. 14, 1997. The man we knew as Pedro Arrupe or, more affectionately, Don Pedro. His brother Jesuits, led by his successor as superior general, Peter-Hans Kolvenbach. S.J., celebrated the day in a special way in the church of the Gesù in Rome. The ceremony had a disarmingly simple title: Commemoration of the Transferral of the Remains of Father Pedro Arrupe. S.J. 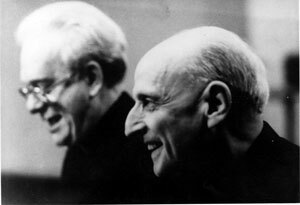 In reality it was a family gathering of Jesuits and friends, including some members of Father Arrupe's family, who filled the church. All shared in a Eucharistic celebration that was simple, prayerful, joyful and very moving. As Father Kolvenbach pointed out, it was a fitting occasion for us to thank the Lord for his wonderful gift of Father Arrupe to the church and to the Society of Jesus. Four Jesuits flanked Father Kolvenbach at the altar, evoking different stages of Father Arrupe’s Jesuit life: Ignacio Echarte, S.J., the current provincial superior of Loyola, Father Arrupe's original province in Spain; José María Maruri, S.J., and Giuseppe Pittau, S.J., his longtime associates in Japan; and I, who had been an assistant to Father Arrupe during his term as superior general from 1965 to 1983. My thoughts kept drifting back to Feb. 5. 1991, when Pedro Arrupe died in his small, plain infirmary room after a long and painful illness of 10 years. We had gathered there day after day during the final week, and watched and prayed as life drained out of him. His body was waked in the church of our Jesuit curia for several days, and it seemed as though all of Rome passed by to pay their final respects. His face had become utterly peaceful and composed and bore a striking resemblance to the death mask of Ignatius of Loyola. As I gazed at his face in profile, I recalled how Don Pedro loved to visit the rooms where Ignatius lived and died in the residence next to the Gesù. Before the feast of St. Ignatius on July 31 each year, he would take real delight in stealing away to spend three days there in prayer and reflection. He would laugh when 1 reminded him that he could not count on osmosis in this ease. Father Arrupe's funeral liturgy in the Gesù church had been marked by an appealing simplicity. An open book of the Scriptures lay on top of the simple wooden casket that rested on the bare floor of the church. (At Pope Paul VI’s funeral in August 1978, in St. Peter's Square, a gentle breeze had played gracefully with a page of the Scriptures, also open upon his wooden casket.) When the final blessing had descended on Don Pedro's remains, a group of his brother Jesuits carried the casket out of the church. Their measured pace met its counterpoint, a spontaneous burst of applause, both heartwarming and heartbreaking, from the congregation. At the start of the Mass commemorating the return of Father Arrupe’s body to the Gesù, Father Kolvenbach set the appropriate tone. He invited us, as we gathered together in the name of the Lord on this feast day of St. Joseph Pignatelli, which was also the anniversary of Father Arrupe's birth, "to celebrate a Eucharist of thanksgiving and of praise, in affectionate and grateful recall." We are only the earthenware jars that hold this treasure, to make it clear that such an overwhelming power comes from God and not from us. We are in difficulties on all sides, but never cornered; we see no answer to our problems, but never despair; we have been persecuted, but never deserted; knocked down, but never killed: always, wherever we may be, we carry with us in our body the death of Jesus, so that the life of Jesus, too, may always be seen in our body. Many in the congregation, aware of the life of Pedro Arrupe and how this reading applied to him, were visibly moved. The Gospel passage read at the Mass was from Mark (3:31-35). Jesus asks the people gathered about him: "Who are my mother and my brothers?" He replies: "Anyone who does the will of God, that person is my brother and sister and mother." Father Kolvenbach applied this text to St. Joseph Pignatelli and Father Arrupe: "Together with Father Jan Roothaan [superior general, 1829-52] who is buried in the same chapel, they are deeply united in the mission proclaimed in this evening's Gospel: to fulfill the will of the Father of Jesus and in this way to become the brothers and sisters of the Lord; to gather in one family all those who live, in their flesh and in their hearts, according to the will of God in Jesus." A word about Joseph Pignatelli. Born in Spain in 1737 of an Italian father and a Spanish mother, both of noble descent, he joined the Society of Jesus in Spain and was ordained a priest at age 25 in 1762. When Charles III of Spain expelled the Jesuits in 1767, Pignatelli was placed in charge of 600 Jesuits, who embarked in 13 ships from Tarragona for Civitavecchia, near Rome on Italy's western coast. Thus began an odyssey replete with physical hardships, heartbreaking rejections and endless wanderings that lasted 40 years. After three difficult months at sea, the exiles were refused entry at Civitavecchia and also at Bastia in Corsica before finding refuge at Ajaccio, Corsica, where Pignatelli managed to house and feed them. This was the first demonstration of his legendary ability to provide lodging, food and work for his brother Jesuits in exile. When Corsica came under the control of France, the exiles had to put to sea again, since France had banished the Jesuits in 1762. On landing in Genoa, they learned that they could find asylum in Ferrara, a part of the Papal States. Pignatelli led his group of Jesuits, which had now doubled in size, on foot to Ferrara, 300 miles away. With the help of some of his relatives, Pignatelli managed to settle the exiles and provide classes and academic projects for them. Then in 1773 the terrible blow fell. Pope Clement XIV suppressed the Society of Jesus. The Jesuits in Ferrara were disbanded, and Pignatelli moved to Bologna, where he lived from 1773 to 1797, working for the restoration of the Society. He managed to remain in contact with a group of Jesuits still in existence in White Russia. When Ferdinand became Duke of Parma and wished the Jesuits to return, Pignatelli encouraged him to seek the approval of Pius VI for this initiative. With papal permission, Ferdinand received approval from the Jesuit superior general in White Russia to have a vice province in Parma, attached to the Society in White Russia. Pignatelli joined the group in Parma, renewed his vows in 1797 and was named provincial superior of Italy by the superior in Russia in 1803. When the French occupied Parma in 1804, once again the Jesuits were expelled; but they found a home in Naples. Many former Jesuits joined them; and, with the authorization of Pius VII, Pignatelli presided over the restoration of the Society in Naples. In 1806 the French seized Naples, and the Jesuits were again dispersed. This brought Pignatelli to Rome, where Pius VII turned over the Gesù and the Roman College to them. From Rome Pignatelli directed the restoration of the Society in Sardinia in 1807 and opened colleges in Rome, Orvieto and Tivoli. He died in 1811, completely exhausted from his life of continual struggle in exile, three years before the restoration of the whole Society of Jesus by Pius VII in1814. Pius XI beatified him in 1933 and Pius XII canonized him in 1954. Father Kolvenbach, in his homily, pictured Pignatelli and Arrupe as true successors of St. Ignatius Loyola. The ruling passion of Ignatius, he said, "was to search for and discern what God wants for the life of the world, not in any abstract sense, but very concretely, here and now, in the life of each individual, of the church, and of the world. Father Kolvenbach’s homily, as powerful as it was brief, gripped and moved the congregation. Words and phrases from it kept running through my mind as the Mass continued. After members of Father Arrupe's family had brought the gifts of bread and wine to the altar, the liturgy of the Eucharist followed in a reverent, prayerful and joyous manner. The full-throated singing of the congregation revealed its vibrant mood. Just before the final blessing, Father Kolvenbach and the four concelebrants made their way to the Chapel of St. Joseph Pignatelli for a moment of silent prayer. Then came the final blessing, and it was over. There was electricity in the air of the sacristy as we removed our liturgical vestments. A Basque television crew had filmed the Mass and was now asking for comments from us. It was clear that this had been no ordinary event. This was a day to savor and reflect on, a moment not to be forgotten, a defining moment. Because of the consistency in his life between what he did and what he said, Pedro Arrupe had the great gift of making the vision of a truly Ignatian life, the life he articulated, not only credible but also infectious. And he did this both in the full vigor of his life and in the long years of silent and patient suffering. Fr. O'Keefe exemplified that same creative fidelity. When asked about a particular issue I saw in l968 he immediately referred me to the provincial who apparently took action to resolve it magnificently. What a magnificently told and engaging history! The article itself is a prayer of sustinance, certainly inspired by the Holy Spirit, for all who seek to carry on the mission of Christ. An article that certainly speaks to situations in the Church today, and to those who struggle with her leadership. Something for me to pray about. Vincent T. O'Keefe, S.J., was one of four general assistants to Pedro Arrupe. S.J., superior general of the Society of Jesus, from the time of Father Arrupe's election in 1965 until 1983, when Peter-Hans Kolvenbach. S.J., was chosen to succeed Father Arrupe. Fr. O'Keefe died on July 22, 2012.